From Neopolitan to New York Style to Belizean.. .there’s something for everyone! 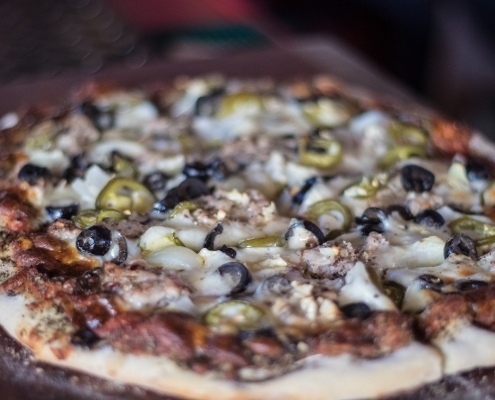 It’s a question we are often asked: where is the best pizza in Placencia? There’s plenty to go around on this beautiful stretch of land, and they’re all so good in their own way. 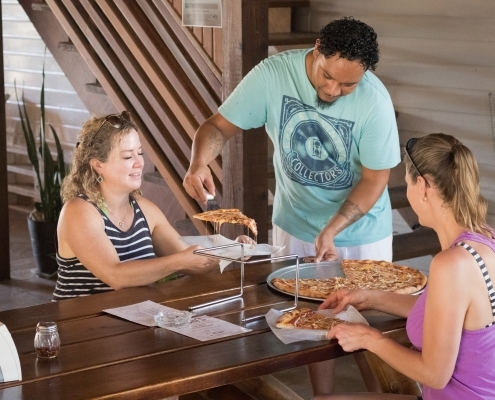 Placencia’s pizzas are prepared with high quality and fresh ingredients and range from classic Neopolitan to New York to Belizean home style. 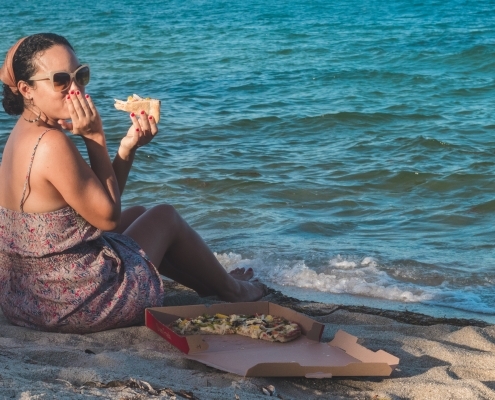 You won’t find fast food franchise pizza here but, thanks to new delivery services on the Peninsula and a paved road, you can have your gourmet pizza of choice delivered right to your door no matter where you are staying. 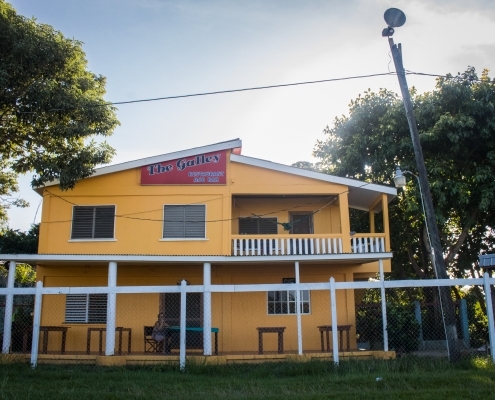 The pizza rave in Placencia began in the late 1990s. Pickled Parrot and The Galley were the only two places on the Peninsula offering a steady supply just before Francis Ford Coppola’s Turtle Inn joined the band wagon. While it’s no longer on the menu at the Parrot, you can ask new owners Eugene and Lynn to order one in for you from any of the places we’re about to talk about, several of which joined later in the 2000s. 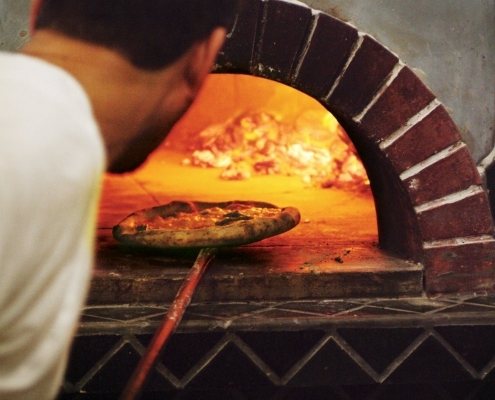 Coppola’s rustic luxury resort offers the only wood fired oven Neopolitan pizzas from Turtle Inn’s Mare (pronounced Mah-reh) Restaurant. On Sundays you can enjoy a very attractive two-for-one special! Julia Berry started The Galley in 1982 on the Placencia Village sidewalk serving Caribbean and Belizean inspired dishes. In the 1990s her daughter, Dawn, passed along the recipes for her home style pizzas that had become popular at supermarkets in Belize City, and they’ve remained a classic local staple ever since, beloved for a thick crust with heavy toppings that leaves families feeling full. The seafood special topped with chunks of lobster tail and shrimp is a favorite. Today, The Galley, which sits behind the sports field, also offers thin crust and personal size pizzas along with their famous milk shakes. The new kid on the block, Cha Chi’s, has quickly developed a reputation as the hot new pizzeria in town since opening in 2017, serving true thin crust New York Style pizza with a weekly live music lineup. While customers can enjoy the traditional cheese, sausage or pepperoni, Cha Chi also offers a few local twists like the popular smoky and sweet Kriol Pizza prepared with sour cream, bacon and ripe plantains, as well as a Primavera that uses chaya, a highly nutritious local green that surpasses the good stuff in spinach. Cha Chi’s also offers pizza by the slice – the only place you’ll find that option on the Peninsula! 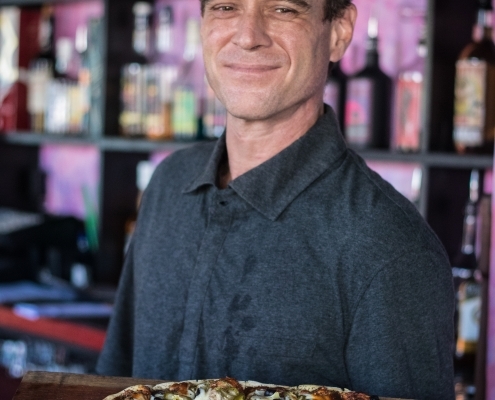 Long time restaurant consultant and businessman in Placencia, Frankie Gagliano, finally opened up his own little piece of gastronomic heaven on the Placencia Sidewalk in 2017. 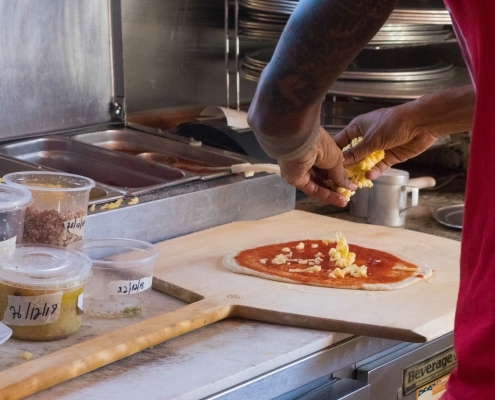 While Afrodite, which pays homage to the Afro-Caribbean woman, has been gaining notoriety for its potent house crafted rums and liqueurs, Frankie’s pizza and calzones are also developing a solid following. Try the Belizean Beach BBQ pizza, topped with BBQ chicken, pineapple, sweet pepper, onion and jalapenos or opt for the King Lewey calzone. See if you can top it off with one of Bartender Jon’s delicious and very stiff traditional daiquiris. Chef Richard LaBonte closed his popular high end restaurant in the Boston area and moved to Placencia in 2005. 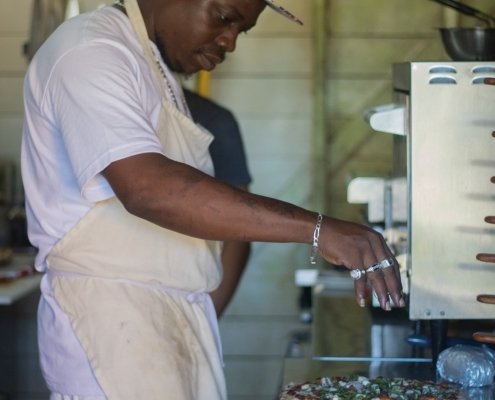 While running the former Purple Space Monkey in Placencia Village he introduced his own take on classic Neopolitan pizzas and has continued to churn them out of his pizza oven at Rick’s Café on the sidewalk (soon to be relocated to the roadside). Rick’s medium sized thin crust pizzas are best eaten hot, and lovers of spicy food will enjoy his Shrimp Fra Diavolo topped with a spicy tomato sauce, roasted garlic, shrimp and basil. Not a fan of spicy? Go for the Greek. 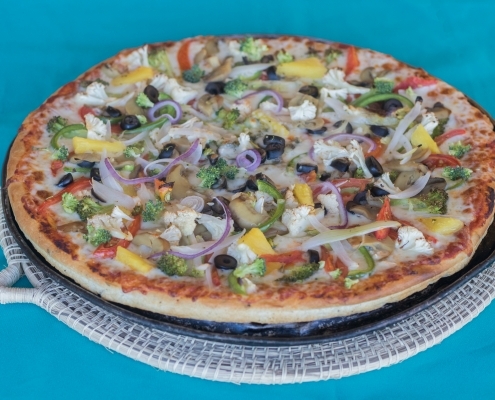 Not up for ordering takeout or making a visit into Placencia Village for pizza? Maya Beach has its gems too. Give the pizza a try at Jaguar Lanes bowling alley. 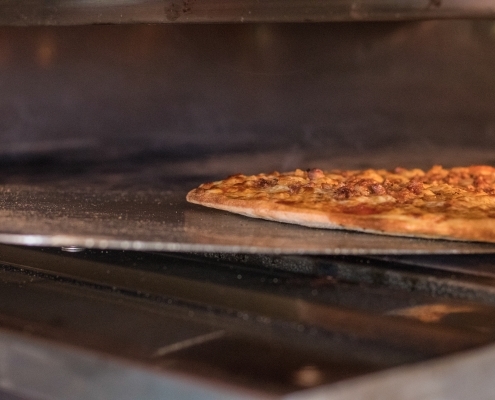 Rumor has it, it’s the number one pizza for some folks on the Peninsula. Others swear by the lunch personal size at Maya Beach Bistro, as well as the pizzas coming out of the ovens at Mango’s Restaurant. 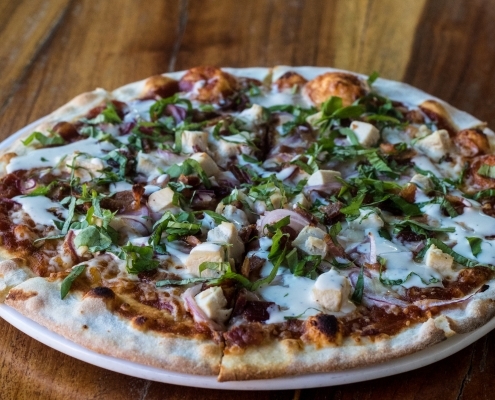 If you’re a pizza lover, Placencia’s selections will definitely steal a “pizza” your heart! Want pizza delivered to Sirenian Bay? Our concierge can make the arrangements! Christmas in Placencia: Our favorite decorations How many tours should you book during your Belize vacation?